A Memorandum of Understanding has been signed between Department for Business Innovation and Skills (BIS) and Ministry of Labour & Employment (MoLE) to enhance the collaboration within the framework of UK India Education and Research Initiative (UKIERI) . The signing took pkace here in New Delhi today after a bilateral meeting held between the delegations led by between Minister of State (L&E), Government of India Shri K. Suresh, and Minister Mr. Matthew Hancock, Minister of State for Skills & Enterprise, United Kingdom. Sharing of technical expertise, building linkages and identification of gaps in the areas of skill development and employment services, improvement in curriculum, benchmarking of assessment, certification and training methods. Supporting development of employment services in India on the lines of National Careers Service, UK. Other beneficial projects, in the area of skill development and employment services, mutually agreed. As a first step, UKIERI will facilitate partnership of Indian stakeholders with the existing Career Services in the UK. 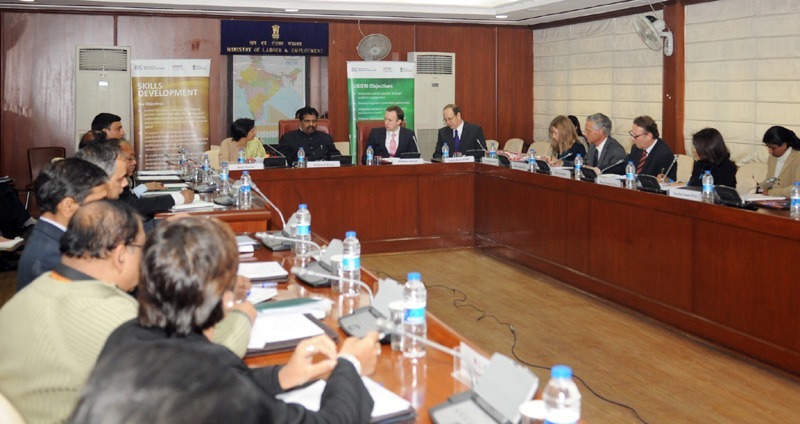 Best practices from the UK will be shared with MoLE and other stakeholders to help develop the Indian model. A workshop in this regard would be jointly organized by MoL&E and UKIERI in February 2014. This initiative will be jointly funded by MoLE and UKIERI. The India cost will be borne by MoLE and the UK cost will be borne by UKIERI. India and the UK will partner on Mentor Councils in the identified priority sectors in responding to the skills demand in the sector and would cover an entire spectrum viz. restructuring of courses, curriculum development, identification and development of good teaching and learning aids, training of trainers with quality, devising assessment mechanisms, improving on the job training etc. UKIERI will support in providing UK experts for the Mentor Councils for upto 10 sectors through institutional partnership between the MCs set up by MoLE and the National Skill Academies in the UK. Each partnership will be jointly funded by MoLE and UKIERI. The Indian cost of the partnership will be borne by MoLE and the UK cost of the partnership will be borne by UKIERI.